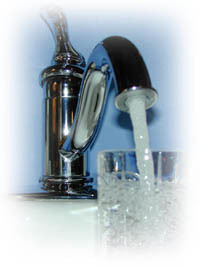 "Water is critical to the balance of all the body's systems, including the brain, heart, lungs, kidneys and muscles. Proper hydration is the bedrock for maintaining healthy blood flow, kidney function, salt/electrolyte balance and digestive functions." We've all been encouraged to drink eight glasses of water each day, but many of us don’t know the full extent of water's benefits. Keep a supply of water containers full in the fridge. That way, water is always on hand as an alternative to other less healthful drinks and conveniently available when you’re on the go. Upon arriving at the office, fill up a big jug of water at the tap. You’ll get plenty of water to drink throughout your workday. Caffeinated beverages act as diuretics and increase fluid loss, so they don’t count toward your daily hydration needs. Try substituting water for your second cup of coffee or that mid- afternoon soda. Don't wait for your body to signal it's thirsty. By that time, you're already starting to be dehydrated. For many Americans, the expense of bottled water is a necessity. Portland Water District customers are fortunate to have a water source as pristine and clean as Sebago Lake as well as a sophisticated ozone treatment facility. Shape Magazine encourages drinking more water for weight control—at least nine cups per day, more if you exercise.According to Shape, drinking water makes you feel fuller, so you're less likely to eat when you're not hungry. In the past 100 years, life expectancy has increased by more than 30 years. According to Jeffrey Griffiths, MD, of Tufts University School of Medicine, much of the credit for a longer life span goes to advancements in clean water, clean food, and wastewater treatment.